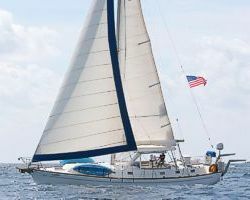 Built by Morgan Yachts, has a 46 foot deck, and an overall length of 50 feet. Superb comfort awaits you with the finest nautical decor, light and airy interiors, air conditioning, plus opening ports and hatches to ensure ample ventilation. The Sopris offers three private cabins for two couples plus crew. Aft is the master cabin with a large king size berth, hanging lockers, private head with shower and a bath tub. The Second guest cabin includes two large bunk beds, plus hanging locker, fans, and shared aft head with shower and bathtub.